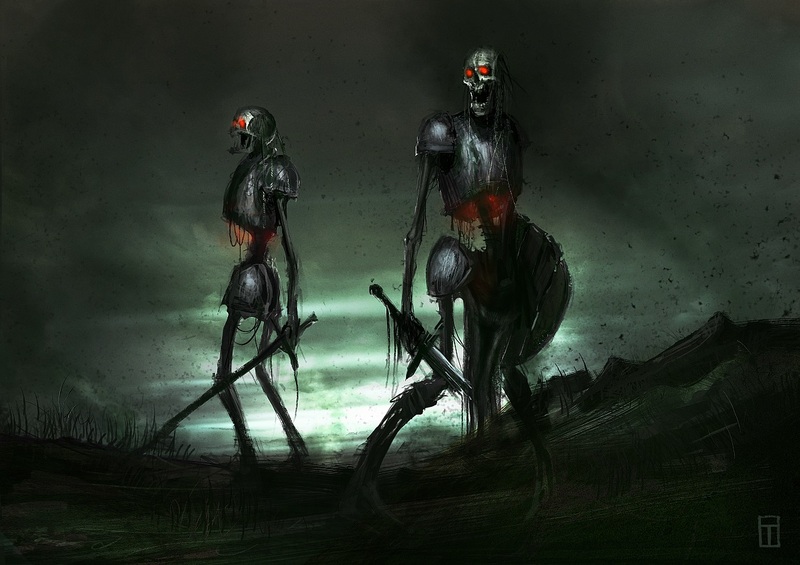 The barrow-wight and wraith listed below were developed before the Monster Manual became available, which contains both a Wight and a Wraith which may meet your needs. These monsters are a much higher Challenge Rating than their Monster Manual cousins, so you might find a use for them. Soul Feed (5/day). Barrow-wights may cast the spell Vampiric Touch with a duration of 1 minute without the need for concentration checks. Sap Will. A creature that holds or wears two or more items from a barrow-wight's treasure while in their lair must succeed on a DC 15 Wisdom saving throw or become paralyzed. At the end of each of its turns the creature may attempt another saving throw. On a successful save, the effect ends. If the creature continues to hold or wear the items, repeat this effect at the end of their next turn. Chilling Touch.Touch Attack: +6 to hit, reach 5 ft., one target. Hit: 36 (8d8) cold damage and creature may only perform an action or move (but not both) on its next turn. Sacrificial Blade (Cursed Longsword).Melee Weapon Attack: +6 to hit, critical hit on natural 19 or 20, reach 5 ft., one target. Hit: 41 (9d8) slashing damage. The barrow-wight can take 1 legendary action and only at the end of another creature's turn. The barrow-wight regains spent legendary actions at the start of its turn. Sleep of the Dead. At night the barrow-wight may cast the spell Sleep (using a 2nd level spell slot) as a legendary action. Unnatural Fog. When the barrow-wight rises to feed at night, it may cause an unnatural fog to rise out of the earth in and around its lair out to 1,000 feet away, making the area heavily obscured up to a height of 25 feet. It lasts until the sun shines on it, or until a sustained wind disperses it. Aura of Dying. Any living creature that ends its turn within a 30 ft. radius of a ghost must make a successful DC 16 Constitution saving throw or take 10 (2d8) necrotic damage. The ghost gains hit points equal to the amount of damage dealt. Incorporeal. The ghost may move through (but may not end its turn in) physical objects and creatures. Breathless Rush. Every living creature that the ghost moves through must make a DC 16 Dexterity saving throw to avoid touching the ghost. On a failed save the creature is paralyzed until the beginning of its next turn and loses 1 hit dice, or takes 20 (4d8) necrotic damage if they have no hit dice remaining. On a successful save the creature takes 5 (1d8) cold damage. Brush with Death.Touch Attack: +7 to hit, reach 5 ft., one creature. Hit: 30 (5d10) necrotic damage, and if the creature is reduced to zero hit points it has disadvantage on all death saving throws until it completes a short rest. Grave Aspect (Recharge 6). Only usable when the ghost has maximum hit points. The ghost turns its terrifying gaze upon a living creature within 60 ft. who can see the ghost. That creature must make a DC 16 Constitution saving throw. On a failed save the creature takes 65 (13d8) psychic damage and becomes frightened for the next 3 (1d4) turns; on a successful save the creature takes half the damage. Elves are immune to this effect. Sorrowful Wail (2/Day). All living creatures within 120 ft. that can hear the wail must make a DC 16 Wisdom saving throw. On a failed save the creature becomes frightened. Elves are immune to this effect. Creeping Death. The lair is colder than the surrounding area and eerily silent. Any necromancy spell cast in the lair has a 50% chance of affecting an additional valid target in range selected at random. Aura of Dying. Any living creature that ends its turn within a 30 ft. radius of a ghost must make a successful DC 18 Constitution saving throw or take 20 (4d8) necrotic damage. The ghost gains hit points equal to the amount of damage dealt. Breathless Rush. Every living creature that the ghost moves through must make a DC 18 Dexterity saving throw to avoid touching the ghost. On a failed save the creature is paralyzed until the beginning of its next turn and loses 2 hit dice, or takes 40 (8d8) necrotic damage if they have no hit dice remaining. On a successful save the creature takes 10 (2d8) cold damage. Brush with Death.Touch Attack: +8 to hit, reach 5 ft., one creature. Hit: 60 (10d10) necrotic damage, and if the creature is reduced to zero hit points it has disadvantage on all death saving throws until it completes a short rest. Grave Aspect (Recharge 6). Only usable when the ghost has maximum hit points. The ghost turns its terrifying gaze upon a living creature within 60 ft. who can see the ghost. That creature must make a DC 18 Constitution saving throw. On a failed save the creature takes 130 (26d8) psychic damage and becomes frightened for the next 3 (1d4) turns; on a successful save the creature takes half the damage. Elves are immune to this effect. Sorrowful Wail (2/Day). All living creatures within 120 ft. that can hear the wail must make a DC 18 Wisdom saving throw. On a failed save the creature becomes frightened. Elves are immune to this effect. When the ghost has maximum hitpoints it can take 1 legendary action and only at the end of another creature's turn. The ghost regains spent legendary actions at the start of its turn. Dominate the Living (3/Day). The ghost may innately cast the spell Command (using a 3rd level spell slot to target up to three creatures) as a legendary action. The Spell Save DC is 18. Paralyze with Fear (4/Day). The ghost may innately cast the spell Hold Person (using a 3rd level spell slot to target up to two creatures) as a legendary action. The Spell Save DC is 18. Elves are immune to this effect. Creeping Death. The lair is colder than the surrounding area and eerily silent. Any necromancy spell cast in the lair has a 75% chance of affecting an additional valid target in range selected at random. Aura of Weakness. Any living creature that starts its turn within 10 ft. of the spectre must make a successful DC 16 Constitution saving throw or they have disadvantage on Strength and Dexterity checks and saving throws, and non-spell attack rolls. Incorporeal. The spectre may move through (but may not end its turn in) physical objects and creatures. Multiattack. The spectre makes two attacks when it takes the Attack action. Devour Soul.Touch Attack: +7 to hit, reach 5 ft., one target. Hit: 66 (12d10) necrotic damage and spectre gains hit points equal to the amount lost by the creature. The spectre can take 2 legendary actions and only at the end of another creature's turn. The spectre regains spent legendary actions at the start of its turn. Stupify. When the spectre has maximum hit points, the spectre may innately cast the spell Hypnotic Pattern as a legendary action. End of Hope.Resurrection spells automatically fail when cast on a target in the lair of a spectre. Terrible Presence. Any living creature within a 30 ft. radius of a wraith or within sight of a wraith must make a successful DC 16 Wisdom saving throw versus fear or become frightened for as long as they remain in the wraith's presence or within sight of it. Foul Worms. Wraiths are accompanied by poisonous centipedes, crawling spiders, small snakes, and other foul insects. Any creature within 5 ft. of a wraith must make a successful DC 8 Constitution saving throw versus poison at the beginning of each of their turns or take 2 (1d4) poison damage from poisonous bites. Shrieking Curse (Recharge 6). The wraith shrieks affecting all living creatures in a 120 ft. cone as if the Bestow Curse spell was cast on them, with spell save DC 16. The curse grants disadvantage to the each creature's Constitution checks and saving throws. This effect lasts for 1 minute. Pull Into the Unseen. Once the wraith deals 20 or more damage to a living creature with touch or with a weapon it holds, the creature gains truesight and the creature's Constitution score is reduced by 1 at the end of each of its turns until it reaches 0. If the creature receives any healing, the effect slows to reducing Constitution score by 1 each hour. When the creature's Constitution score is 0, they die immediately and their spirit moves into the Unseen realm. If the creature has 1 or more Corruption points when they die, they become a wraith upon resurrection. Paralyzing Touch.Touch Attack: +7 to hit, reach 5 ft., one target. Hit: 14 (4d6) cold damage and target must make a successful DC 16 Constitution saving throw or become paralyzed until the end of their next turn. Ancient Blade.Melee Weapon Attack: +7 to hit, critical hit on natural 19 or 20, reach 5 ft., one target. Hit: 19 (3d10 + 2) slashing damage and 11 (2d8 + 2) necrotic damage.